NOTE: I spend my Wednesdays Unplugged from appointments. It's my day to stay home, enjoy cooking and welcome our kids and grandkids for dinner in the evening. We end our meal with quotes from the Norwegian 'Quote Cup' passed on to me from my grandmother. I share a quote and a recipe here each week, and sometimes some photos of family fun. I love trying new recipes...and love getting recipes you would like to share! It seems like our anniversary comes around quicker each year! 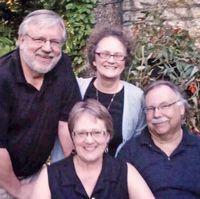 Last night celebrated 41 years with dear friends who share the same anniversary in Jax Cafe's outdoor patio. It was a perfect evening... beautiful weather, great food, wonderful friends! We have had such a warm year so far this year... learned this week that temperatures March through May were the warmest on record since record-keeping began in 1873! Average was 54 degrees, previous record of 52.5 was set in 1977.
the richness with a big green salad. Could also use any other pasta that suits your fancy, I prefer fresh from the refrigerator case. Cook asparagus pieces in large pot of boiling salted water until crisp-tender, about 2 minutes. Remove and rinse asparagus with cold water, drain and set aside. Add ravioli to the same pot of water and cook 6-8 minutes or until al dente; drain. Meanwhile, combine Gogonzola ad whiping cream in large saucepan. Cook over medium-low heat until cheese melts and mixture is almost smooth, about 4 minutes. Add drained ravioli to gorgonzola and gently stir to coat. Mix in asparagus and drizzle lemon juice over. Season to tast with salt and pepper. Serve sprinkled with walnuts and shredded Parmesan cheese.